He was about to go canoeing for the first time. But just getting into a canoe was a big step for a teenager who uses a wheelchair and has trouble maintaining his balance. As one of his camp counselors helped him get in, the boat kept rocking back and forth, making it even more difficult for him to balance. Finally, they were out on the lake. The boat kept rocking, which scared him quite a bit, but they kept going. When they reached the middle of the lake, he reached his hand outside of the canoe and grazed the top of the water with his fingertips. “We can go back now,” he said. That moment changed one young man’s life forever. Though he gained a lot of confidence and overcame his fears by getting into that canoe, it wasn’t the camper whose life changed. It was Zack Patton ’18, the Flying Horse Farms camp counselor who helped him through it. 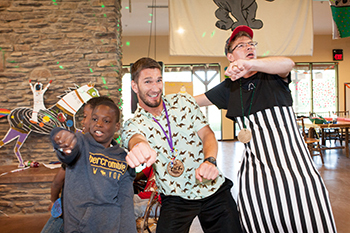 With the help of Jill Rogers, health advisor and program coordinator for Wabash’s Global Health Initiative, Patton began as a camp counselor at Flying Horse Farms, a free camp in Ohio for children with serious illnesses, three years ago. It quickly became his “favorite place on Earth,” and he continued to go back each summer. His second year, he worked as a “village leader,” which was more of a managerial role, and this past summer, he was a member of the camp’s psychosocial team. Providing emotional support can be taxing and requires active listening, self-awareness, skilled communication, and strong judgment. However, Wilkinson said Patton has always put the needs of others before his own. Patton calls Flying Horse Farms his favorite place on Earth. He admits that the work could be difficult at times, but Wabash prepared him for the challenge. “I learned to embrace challenges to the point that I now enjoy them,” he said. After seeing the impact a free-of-charge camp like Flying Horse Farms could have on children and their families, Patton decided to spread the word about the camp to families in Indiana and made presentations to the Peyton Manning Children’s Hospital and Riley Hospital for Children. 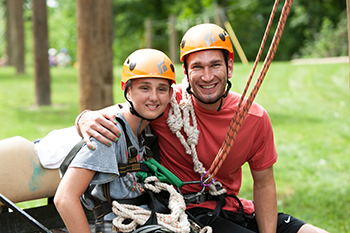 “There have now been a handful of kids whose lives have been changed by camp who wouldn’t have known about FHF without the extra effort Wabash taught me to put forth,” he said. Patton recently began his first year at the Indiana University School of Medicine and plans on taking everything he learned at Flying Horse Farms with him to Bloomington.